For over 40 years, tourists and people with kidney ailments came to La Buvette d’Evian for the healing properties of the region’s water. 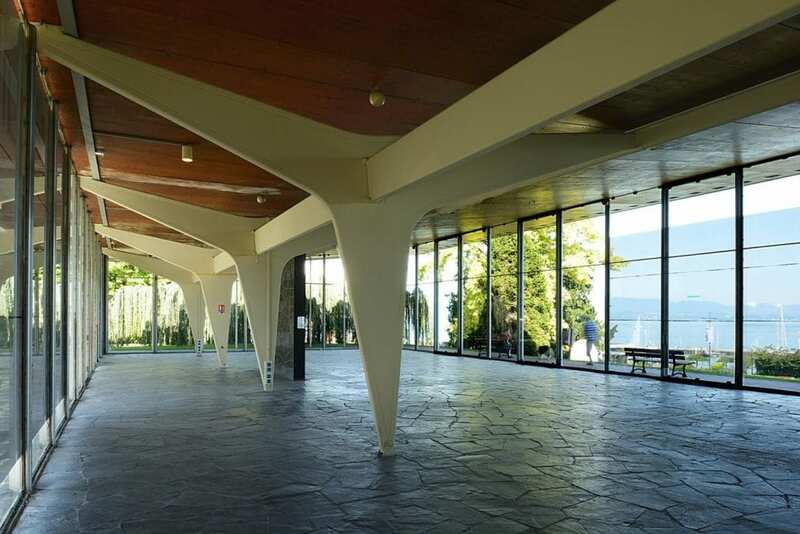 This lakeside refreshment area – which measures 74 meters long and 14 meters wide – was designed by Jean Prouvé, a leading figure of 20th century civil engineering, as well as fellow civil engineer Serge Ketoff and French architect Maurice Novarina. Construction work began in 1955, and the pavilion-like building was inaugurated in 1957. La Buvette is considered a masterpiece of modern architecture and has been listed as a French cultural heritage site. Nowadays, however, La Buvette has been largely forgotten – apart from a clumsy attempt at updating it – and abandoned. Only a gym operates on its eastern side. But Danone, the site’s owner, recently teamed up with the French-speaking chapter of the Swiss Federation of Architects (FAS) to commission a study by EPFL on the potential for renovating La Buvette and showcasing its unique architecture. The study was led by two EPFL researchers – Giulia Marino, scientist and lecturer, and Franz Graf, head of the Laboratory of Techniques and Preservation of Modern Architecture (TSAM) – who conducted an in-depth evaluation of the existing structure and combed through La Buvette’s archives to determine what architectural renovation work was most pressing. The results of their work have been compiled into a book that will be unveiled on 6 December. “Everyone around here has heard of La Buvette, but few people know much about its history. So that’s why we wanted to publish this book. The site hasn’t had a real purpose since the refreshment stand was closed, and the residents of Evian don’t really know what to do with it. We wanted to explore ideas for restoring its connection with the local community,” says Marino. When the stand was open, people would stop by after visiting the nearby thermal bath – generally between May and October. They had to pay to enter but could have something to drink and listen to live music. The structure – modern for its time – contrasted with the surrounding landscape and with the older equipment at the thermal bath, which was fashioned in the Belle Epoque style. The EPFL researchers identified several reasons why La Buvette has become an architectural icon. First, it combines several of Prouvé’s innovations and experiments with new methods; his firm was struggling at the time and he needed to find a new strategy. For example, the structure is the first to use steel “crutches” – asymmetrical load-bearing elements that are both effective in terms of function and elegant in terms of design. These crutches, placed in a star shape, went on to become a hallmark of Prouvé’s work. Second, La Buvette was made from an unorthodox combination of materials – solid wood, composite wood, steel, aluminum and glass – assembled in a novel way. Its roof was also innovative, as it consisted of wooden and metal elements arranged in an intricate system that had never before been tested on an actual building. The goal was to keep it light – essential for this type of covering – yet waterproof. The EPFL researchers also found that the building’s architects initially wanted to play down the transition between the indoor and outdoor spaces. Previous renovation work ignored this fact, an error which the researchers feel should be corrected. “We found letters that had been sent back and forth between Prouvé and the French building permit office. Nobody at the office thought the structure would hold up. But it’s still standing! And at first glance, it even looks like it’s in great shape,” says Marino, who adds that more extensive structural analyses are under way, coordinated by TSAM and based on the researchers’ initial assessment. The researchers also uncovered several anecdotes that highlight not only the value of La Buvette, but also fluctuations in the popularity of the region’s thermal baths in the 20th century. Graf and Marino offer several ideas for renovating La Buvette. They dismiss the proposal of turning it into an art gallery, which would require heavy structural work, or into a space that could be used year-round, as that would require closing it in and installing heating – something the structure wasn’t designed for. They feel it’s important to return to La Buvette’s initial purpose: a covered space that opens out onto a park and the beautiful Lake Geneva landscape. So no restaurant or gym; rather, a spacious area for seasonal exhibitions and events. The researchers also suggest incorporating the element of water back into the structure’s design. La Buvette initially housed a magnificent fountain paying homage to Evian’s therapeutic water. They believe that La Buvette’s reputation as an emblematic site of the region will be enough to attract visitors, and that such a prestigious structure should also have prestigious surroundings. The areas around La Buvette could be renovated as well with this in mind. Franz Graf, Giulia Marino, &laquoLa Buvette d’Evian, Maurice Novarina, Jean Prouvé, Serge Ketoff, 1955-2018», Infolio, 2018, 296 pages.